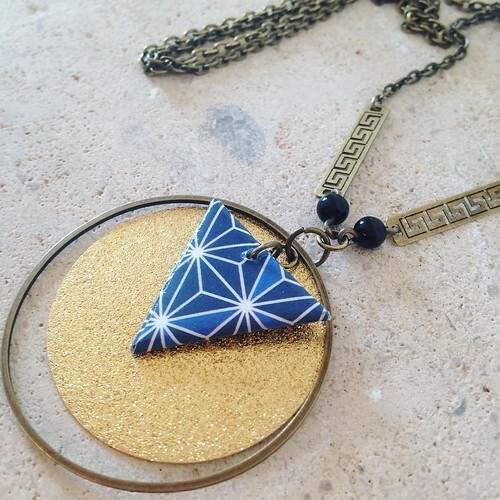 It's been way too long since my last post about paper jewelry... at least I think so! 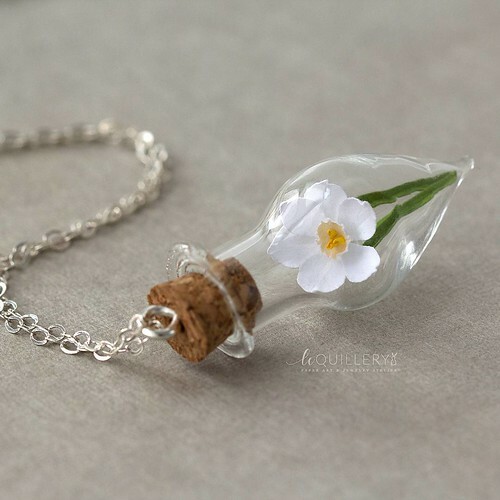 I love wearing jewelry with paper elements because of the surprise factor. Whenever someone leans in for a closer look, their expression is reliably one of pleasant shock when they realize simple paper is involved. And so I went in search of new favorites that have me looking forward to warm weather. On Monday, I'll be featuring even more... after all, the change of seasons requires a few accessory updates, right? Right! If sweet and delicate is your style, the hand sculpted floral necklaces and woven paper earrings made by Kai of Le Quillery are just the ticket She recently relocated from Germany to Daegu, South Korea... such a big move caused Kai to take a break from the business, but as of this week she is back with some of the cutest jewelry you will ever find. See new pieces on Instagram where she is @lequillery (edit: no longer on IG]. 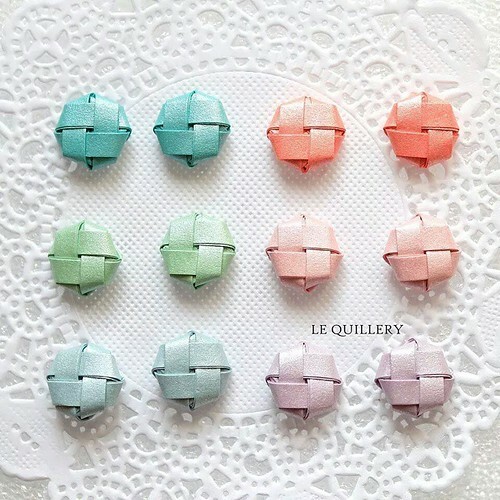 Speaking of Instagram, I noticed the eye-catching jewelry of Myl'et 1 Creations / Plumes & Co. Mylene has been combining pretty papers in a rainbow of colors and patterns with unique findings for the past four years. 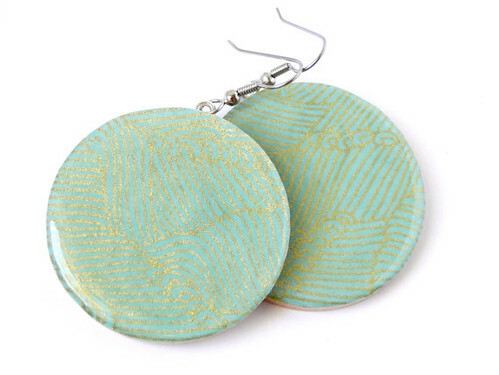 These earrings are spot on for spring's cork trend. Located in Ambillou, Centre, France, she often sells her jewelry at local shows or contact her via Facebook. 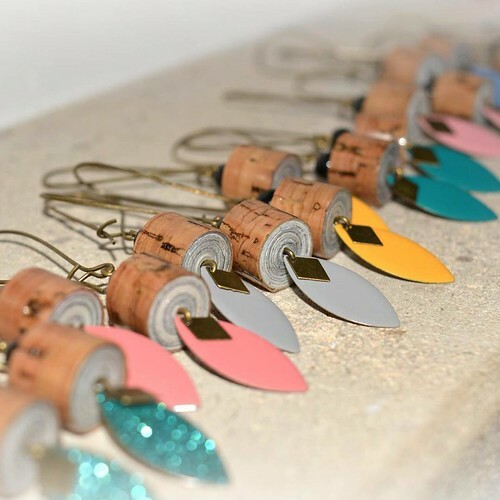 Manue Reynolds of Etsy shop Pretty Kiku in Austin, Texas makes stylishly simple earrings by hand cutting Japanese chiyogami papers into geometric shapes and applying them to laser cut Baltic birch wood. Each piece is finished with a coat of glossy resin and stainless steel (nickel-free) ear wires. 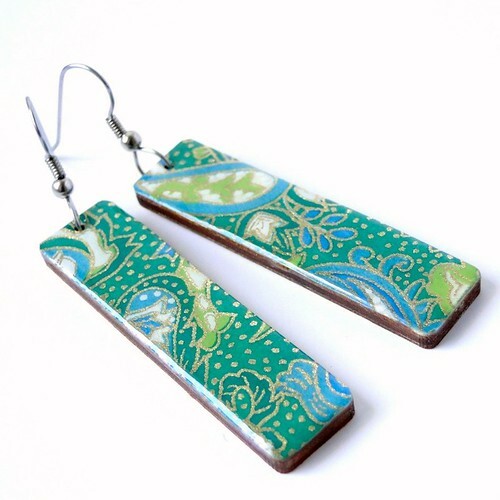 Here's the perfect pair to wear on a hot summer's day... they have me thinking of rippled water in a tropical pool. See more on Manue's Facebook page, Pretty Kiku and on Instagram. How about a nautical paper find for the guys? What a great idea for those who are celebrating their first wedding anniversary since paper is the traditional gift. 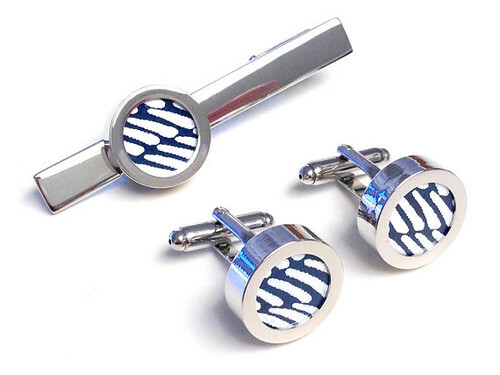 Anna V. of Paper Anniversary Love in San Francisco creates custom rhodium tie bars and cufflinks using your own special paper - perhaps your wedding invitation - or choose one of the colorful papers she supplies. For the ladies, I'm admiring the Thai bamboo paper with metallic accents that covers Anna's Neptune necklace and earrings. The findings are sterling silver. Her Etsy shop is Paper Anniversary Love. 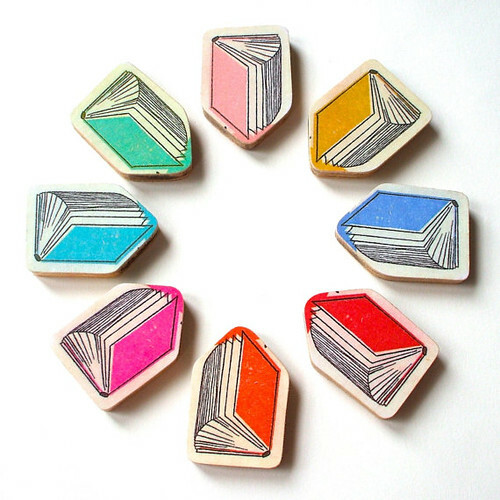 Speaking of Etsy, its daily email alerted me to these super-cute book brooches from lucieOellen. What a great gift they would make for a librarian, teacher or any book lover... ooh, perhaps as a reward for completing a summer reading list! Each color is available as a necklace too. 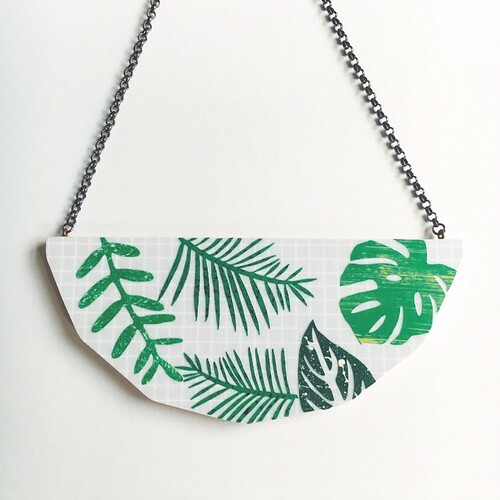 Many of the items Lucie makes in her East London studio are painted directly on birch plywood, but like the book brooches, the statement necklace above is paper covered... in this case with a collage of painted and hand cut foliage. 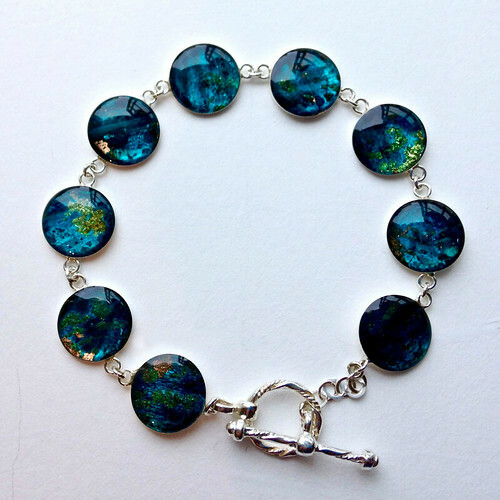 In addition to Etsy, Lucie Ellen is on Instagram and Facebook. I've featured the Etsy shop of Hilary Bravo of Topsham, England previously, and follow her on Facebook where she keeps us up-to-date on her latest work. 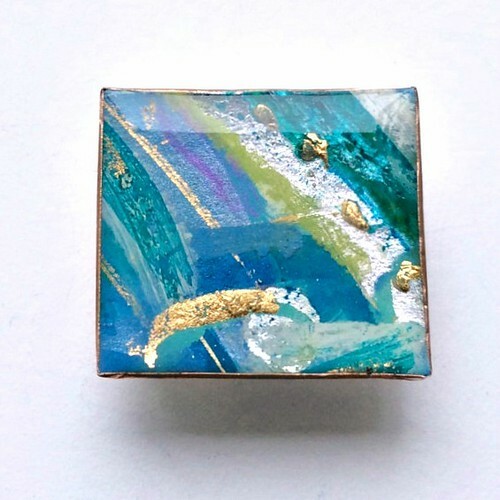 As a fine artist, Hilary creates abstract paintings and then boldly slices them into smaller pieces that she transforms into shiny jewelry with a paper maché base. 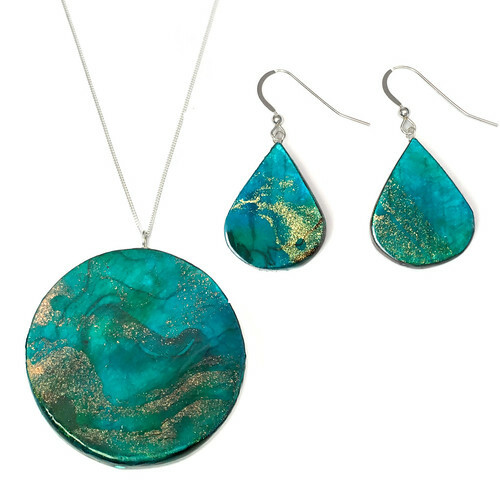 Many of her newest (and reasonably priced) pieces remind me of sparkling water and days at the beach. Hilary shares informative process videos on her You Tube channel. She is also on Instagram and Pinterest, and in addition to Etsy, sells her work via art and craft galleries in England. Have a great weekend and check back on Monday for my next paper jewelry installment. Love them all! Amazing what can be done with paper. Thank you Ann. Such creativity and talent. All are beautiful! I'm glad you enjoyed the post, Sande and HalfWhit! P.S. I don't know her personally or that I'm related to her. Thanks for the tip, allispinkk! Today's jewelry post is all ready to go, but I will definitely keep her on my radar.